If you’re looking for something to do when you’re not playing, or you’ve given up asking Mum or Dad for some canteen money, you can always play on the scoreboard. 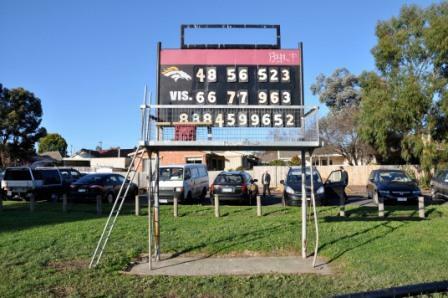 Springfield Park in the eastern Melbourne suburb of Box Hill is home to the Whitehorse Colts Junior Football Club. 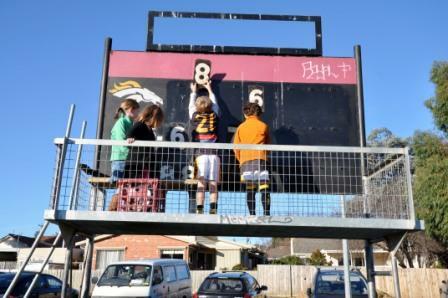 The Colts field teams from Under 9s to Under 17s in the Yarra Junior Football League, including a girls team. Jim Pavlidis is an artist with a keen interest in interpreting football. His many credits include The Age and the covers of the 2008 Footy Almanac (Penguin Viking) and the Tom Petsinis book of poetry, Four Quarters (Australian Scholarly Publishing 2006). 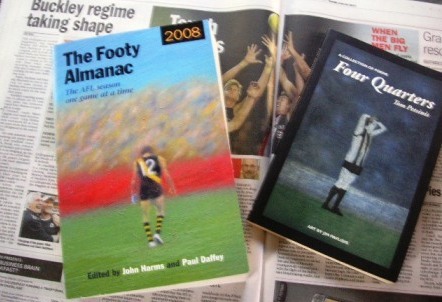 Four Quarters features several of Jim’s etchings, including his etching of the 1977 tied Grand Final MCG scoreboard. ‘Scoreboards are beautiful,’ he says.